In Chemnitz, in eastern Germany, around three o'clock in the morning on Sunday 26 August, three German men were involved in a heated exchange of words with a number of immigrant men. Two of the immigrants drew knives and attacked the Germans. One of them, Daniel Hillig, 35, received six stab wounds and died shortly afterwards. His companions, 33 and 38, were also knifed and severely injured, but survived. Daniel was a carpenter, with a partner and seven year old son. Ironically, he too had been an immigrant: now a German citizen, he had 'Cuban roots'. 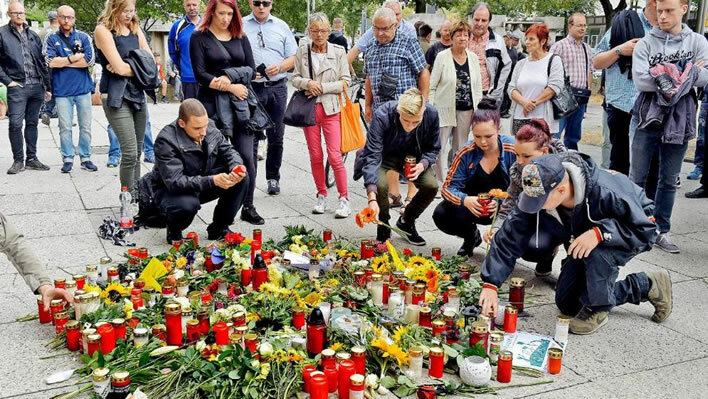 The attack occurred in the hours following the closure for the night of a public festival to mark the 875th anniversary of Chemnitz. When the news of the Daniel's death became public in the hours following, many people in Chemnitz were deeply shocked. A spontaneous shrine was set up at the scene of the attack, next to the puddle of blood that still marked the spot. By that time a Syrian (23) and an Iraqi (22) had been arrested for the killing. Just one example of the media hysteria after the Chemnitz murder, Bild's disgraceful preventive same-day strike against all the insincere thugs in the picture: 'Mourning in Chemnitz. But what is genuine sympathy, what the means to an end for rightwing agitators?' [Trauer in Chemnitz. Doch was ist echte Anteilnahme, was Mittel zum Zweck für rechte Hetzer?] Image: ©AP, BILD. As Sunday progressed, more and more people visited the scene and congregated in the city centre. Around four o'clock in the afternoon the festival, which had been going on as planned, was cancelled. A march of mourning spontaneously formed to cross the centre of the city and assemble at the site of Daniel's murder. At first the march proceeded in silence. As quickly as the march formed, a counter-demonstration assembled, consisting of a collection of extreme leftwing groups. Unlike the people of the march, many of the counter-demonstrators were masked and, aided by loudspeakers, made a lot of noise. The person who made the famous 19 second 'Hetzjagd in Chemnitz' video was in this march. She is 'Kathrin', a 35 year old German, her husband 'Thomas' is 38. For obvious reasons they wish to remain anonymous. Kathrin: The 19 second long video was recorded at 16:52 on the Sunday of the attack, in the last stage of our march just before we reached the scene of Daniel's killing. The march had become very squeezed together, which is why the women had moved into the middle of the column. And there were no xenophobic shouts. Nothing at all radical rightwing. In the distance we had heard 'We are the people'. Shortly after, it was asserted later, we were supposed to have broken through a blockade – which never existed. Kathrin: Das 19 Sekunden lange Video ist um 16.52 Uhr am Tatsonntag in der letzten Etappe unseres Trauerzugs kurz vor dem Erreichen des Daniel-Tatortes aufgenommen worden. Es war sehr eng geworden auf dem Trauerzug, weshalb die Frauen in die Mitte des Zuges genommen wurden. Und es gab auch keine ausländerfeindlichen Rufe. Nichts Rechtsradikales. Aus der Ferne haben wir ‚Wir sind das Volk‘ gehört. Kurz nachdem wir angeblich, wie es später hieß, eine Blockade durchbrochen hatten, die es gar nicht gegeben hatte. Thomas: Kathrin was slow to get her phone out of her bag, which is why the 19 seconds do not authentically represent the entire happening at the bus stop. Before the video recording started a nasty provocation of the marchers had taken place, by two young immigrants, who at first were standing by the bus stop and actually looked just like us. Thomas: Kathrin hatte zu spät das Handy aus der Tasche gezogen, weshalb die 19 Sekunden tatsächlich nicht authentisch das gesamte Geschehen nahe der Bushaltestelle darstellen. Denn vorausgegangen war der Videoaufzeichnung eine böse Provokation gegenüber uns Trauernden. Durch zwei junge Migranten, die zunächst an der Bushaltestelle gestanden hatten und eigentlich aussahen wie wir. Kathrin: They approached us aggressively and insulted us and also, although it was difficult to understand, shouted 'Piss off' at us. That's how we remember it. Then it came to a physical contact with the pair in which one of our friends got the contents of a can of beer thrown over his clothes and even in his face. Kathrin: Sie waren aggressiv auf uns zugekommen und hatten uns angepöbelt und wohl auch, aber eben schwer verständlich, 'Verpisst euch' gerufen. So haben wir das in Erinnerung. Dann kam es zu einem körperlichen Kontakt mit den beiden, wobei einem unserer Freunde der Inhalt eines Bierbechers über seine Kleidung und wohl auch ins Gesicht geschüttet wurde. Whilst baffled professors of German around the country are trying to work out the precise meaning of Kathrin's command in the dialect of Saxony, husbands around the world recognise it as a command you do not under any circumstances disobey – especially those miserable specimens whose wives call them 'Bunny'. Once should be enough, but for the avoidance of all misunderstanding, Kathrin repeated her command to Thomas: Du bleibst hier! Kathrin: It was possibly not the only attack on our march, because in the distance we heard threatening shouts in what sounded like Arabic. At the position where this provocative act took place, we however were unaware of the 'finger flipping', which other participants later reported. Also no 'chasing down' or even 'hunting people'! We are also prepared to make our statement under oath. Kathrin: Es war möglicherweise nicht der einzige Angriff von Migranten auf unseren Trauerzug, denn aus der Ferne war schon Drohgeschrei in wohl arabischer Sprache zu hören. Allerdings: ‚Stinkefinger‘, von denen andere Trauerzugteilnehmer später berichteten, haben wir am Ort des provokativen Geschehens nicht erkennen können. Aber auch keine ‚Hetzjagden‘ oder gar ‚Menschenjagden‘! Wir sind auch bereit, unsere Aussage eidesstattlich zu versichern. Kathrin uploaded her video to a closed 'citizens group' on WhatsApp that evening. No one knows how the video fell into the hands of the leftwing activists who then got it onto Zeit Online, purporting to show immigrants being 'hunted down' by rightwing thugs in Chemnitz. From that moment on, the media in Germany went berserk with the story of the hunting down of immigrants in Chemnitz. Disgracefully, they were egged on by the coalition government; even more disgracefully by the Chancellor herself. Only Hans-Georg Maaßen, the President of the Bundesamt für Verfassungsschutz, 'Federal Office for the Protection of the Constitution', metaphorically kept his head and pointed out that as far as the police and every official body connected with the event were concerned, such hunting down never happened. That head was the one he would metaphorically lose a few days later. The question of where Kathrin and Thomas have been during the last three months in which their 19 second video caused the dismissal of such a high-ranking, respected functionary and rattled the foundations of the coalition has still to be answered. Perhaps they are just normal citizens, shocked enough by a brutal murder in their town to take to the streets, but who have better things to do with their lives than hang on the spoutings of the German government and the mainstream media which holds its creaking structure up.